In 2005, the Centre and the states of Uttarakhand and Uttar Pradesh had agreed to an alternative alignment for a road between Kotdwar and Ramnagar under the supervision of the Supreme Court, rather than a highway through Corbett. The Wildlife Institute of India (WII) has written to National Buildings Construction Corporation Ltd (NBCC), requesting it to drop a clause in their Memorandum of Understanding (MoU) that requires the premier research institute to “help and facilitate in obtaining necessary approvals” under wildlife and forest laws for a highway cutting through the core of the Corbett Tiger Reserve. Hours after The Indian Express reported on August 18 how the agreement raised questions of propriety and conflict of interest, WII Director V B Mathur emailed the request to NBCC. The letter, which carries a backdate of August 16, followed intervention by the Environment Ministry, said sources. The WII is an autonomous institute under the Environment Ministry. On August 17, Director General (Forests) and Special Secretary Siddhanta Das had told the Express that the ministry would look into the matter. Earlier, asked by the National Tiger Conservation Authority (NTCA) to clarify its position regarding the MoU, which was “apparently in contempt” of court orders regarding the Corbett reserve, the WII had claimed on August 8 that the institute was “only involved in carrying out the feasibility study” for the project and “all legal provisions related to any development in the tiger reserve will have to be addressed” by the state government. 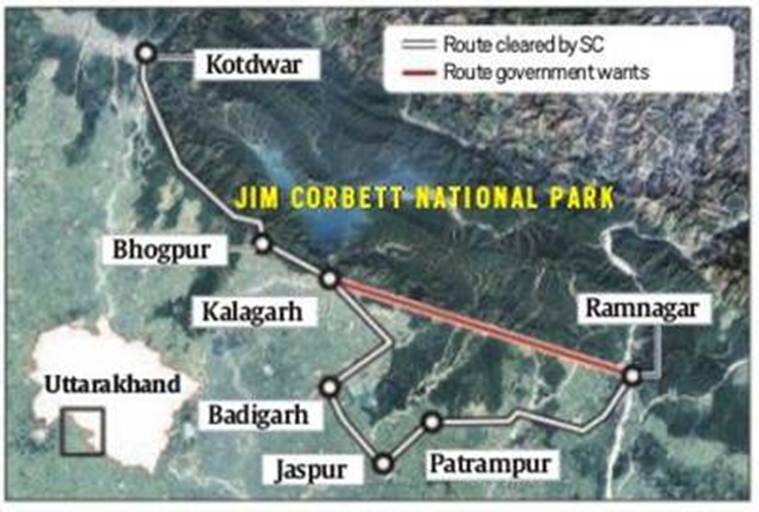 In 2005, the Centre and the states of Uttarakhand and Uttar Pradesh had agreed to an alternative alignment for a road between Kotdwar and Ramnagar under the supervision of the Supreme Court, rather than a highway through Corbett. In 2010, the High Court of Uttarakhand had also made it “absolutely clear that we do not permit any part of the forest to be used” while dismissing a PIL for the same road. The issue of contempt apart, the Corbett Tiger Reserve is legally a no-go zone for development activities. Under the Wildlife Protection Act, “core or critical tiger habitat areas of National Parks and sanctuaries… are required to be kept as inviolate for the purposes of tiger conservation”. In 2010, 1,288 sq km of the Corbett reserve was established as a core/critical tiger habitat. On Friday, Uttarakhand Principal Chief Conservator of Forests Jai Raj told The Indian Express the highway would be built as a “green road” as per the standard template prepared by the WII and accepted by the Environment Ministry last year for linear projects inside protected forests.